Every traditional Spanish cookbook has an ensaladilla rusa recipe. This Russian potato salad has quite a history behind it! World famous Russian potato salad. 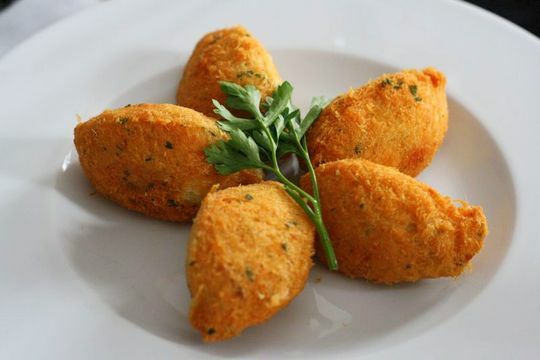 It’s one of the most common dishes in any Spanish tapas bar, and you either love it or hate it. I happen to be a huge fan of ensaladilla rusa, ordering it without fail when we head down south to Seville and Cadiz, where they often add fresh, tender shrimp into the mix and serve it with crunchy little breadsticks called picos. But let’s back up. As its name implies, ensaladilla Rusa has its roots in Russia— in Moscow to be exact. It was here that Belgian chef Lucien Olivier invented this classy version of a potato salad, while working in the exclusive Hermitage Restaurant. Unfortunately, the secretive Olivier took the original recipe to his grave, but food historians think that it was topped with expensive ingredients such as venison and perhaps even caviar. Today, Russian Potato Salad is served all over the world, but it doesn’t much resemble Olivier’s wealthy man’s version. 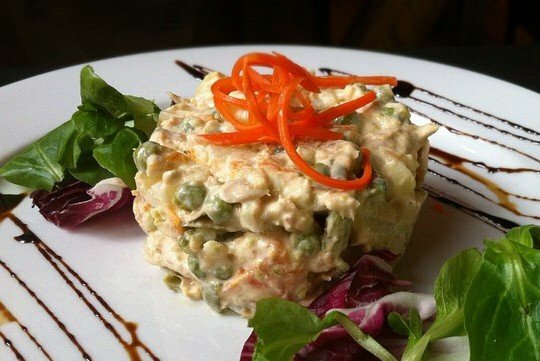 In Spain, your typical ensaladilla rusa recipe includes potatoes, peas, and carrots, and it is typical to add tuna as well. In the south they sometimes add shrimp (which I love) and hard boiled egg. 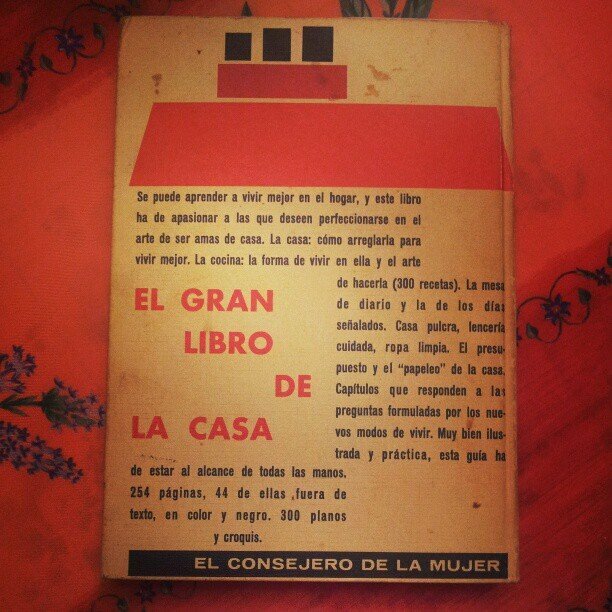 The ensaladilla Rusa recipe I would like to share today has been adapted from an old book I found my mother-in-law using to make torrijas— the woman’s guide to keeping house. Aside from laughing at some of the advice in the book, I flipped through its pages in search of old recipes. The recipe for Russian Potato Salad stood out, because it was completely homemade, likely written before frozen vegetables were even available in Spain. A guide to being a good housewife, via my mother-in-law! The key to a good ensaladilla Rusa is making a homemade mayonnaise. I don’t have too much practice with this, but I tried it for this recipe and it came out great– not as difficult as it seems. But if you want to use jarred mayonnaise and leave out some of the ingredients below, go ahead. 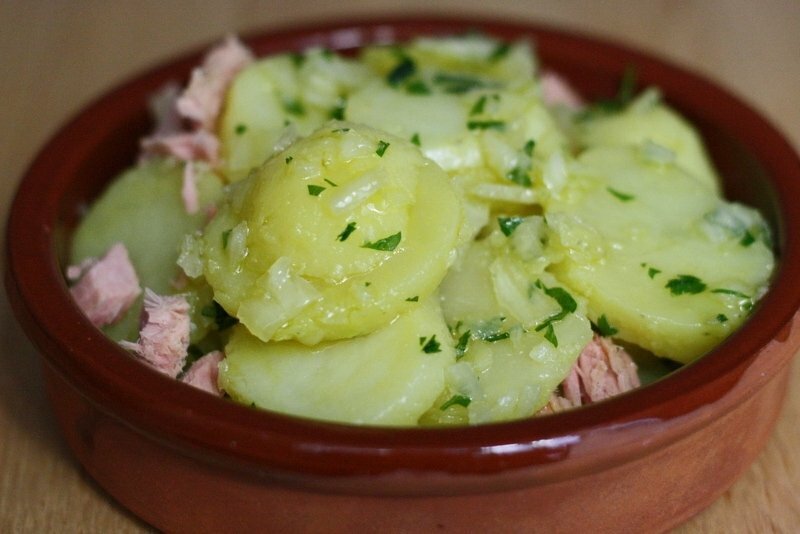 That’s the best thing about any ensaladilla rusa recipe, it adapts to what you have on hand. Despite the Russian name, ensaladilla Rusa has become as Spanish as you can get, and is an important dish in Spain’s culinary history. In fact, towards the end of the Spanish Civil War merely speaking of Russia was forbidden, and people renamed the popular dish Ensaladilla Nacional, the national salad! Ensaladilla Rusa is one of Spain's most typical dishes-- despite its Russian roots! Try this authentic recipe for an unforgettable appetizer or side dish. To prepare the potatoes, wash them and cover them with cold water and a pinch of salt. Bring them to a boil and cook until just tender-- don't overcook or they'll fall apart. Let them cool completely, remove their skin and cut into cubes. To prepare the beets, cover them in cold water with a squeeze of lemon juice or a splash of vinegar to prevent them from bleeding. Boil until tender (about an hour) then rinse under cold water. The skin should peel off easily. Reserve some of the beet for decorating the salad if you wish (the housewife manual suggests cutting thin round disks for decoration) and cube the rest. To prepare the carrots, peel them first and then add them to cold water. Bring to a boil and take off the heat the moment they become tender (you want to cook them just a bit, not completely). Run them under cold water until manageable and cut into cubes. Boil the green bean until cooked and dice. Boil the peas until cooked. Prepare the shrimp if using. Add raw shrimp to a pot of boiling water, leave in for 1-2 minutes until the water just starts to boil again, then take them out and put them right into a bowl with ice and cold water (a ice bath). Peel when cool. Boil one of the eggs until hard-boiled. Reserve the other. Separate the yolk and the white very carefully. In a small bowl, add a pinch of salt and a few drops of vinegar and then beat in the egg yolk. When combined, start to slowly add in the olive oil, beating very quickly to allow emulsification. When it has the consistency of mayonnaise, reserve a little (about ¼) for decorating the salad. Beat the egg white to stiff peaks. Slowly add the beaten egg white into the remaining mayonnaise (this is your clarified mayonnaise). In a large serving platter mix together half of all of the cooked ingredients with some of the clarified mayonnaise (meaning the batch with the egg whites included). Mix the rest of each vegetable with the egg-yolk only mayonnaise and decorate the top of the salad with different colored mountains of different vegetables. Decorate with capers and the leftover beets. Slice the hard boiled egg on top and use it to decorate too. You can also top with shrimp for decoration. If the level of decoration has you a little perplexed, don’t worry, just carefully mix everything together– it’ll be delicious. But as the housewife’s manual says: “serving a nice dinner is a very special moment for a woman to impress her guests and take pride in her home”. So if you want to be truly old-school, you’ll need to decorate. Enjoy your homemade Spanish style Russian potato salad with crunchy breadsticks and crackers. And you can enjoy this dish all year long, as in Spain ensaladilla Rusa is typically served cold in the warmer months, while in Russia it actually makes up part of their Christmas dinner. What’s the oldest recipe in your recipe book? Mmm! I love to put bonito in my Ensaladilla instead of tuna–so good! Interesting with the homemade mayo! When I learned to make ensaladilla rusa, my Spanish friend was insistent that I not use “crappy American mayonnaise” but this goes one step further. I know mayo freaks some people out, but I love all the mayo “salads” here – reminds me of southern cooking in the States! Yes, surprisingly a lot of people and restaurants make homemade mayo here, and I even have friends who take a bite and make a face when they say “it’s not homemade”! Same here. I went beyond the American mayo. I added cream sour, olive oil, lemon, raw garlic, oregano and pepper. Mixed all in my bullet…creamy dressing came which I pour over my vegetables. Mixed with my cleaned bared hands.. I know that it was delicious, because it was the first thing to be finished y my family. I used to be scared of making mayonnaise, but now I do it all the time! I have a stick blender so I just add one egg, some salt, a squeeze of lemon juice, and start blending. Then I add the olive oil in a slow stream until the sound changes (this is how my mother-in-law taught me to do it) y nunca se me ha cortado! I happen to be a big fan of ensaladilla rusa too, but some of the bar versions can be downright terrible! I always garnish it with olives too, mmmm. Funny how international it really is! No matter how it’s named it’s delicious, and also extremely popular here in Greece as well. We love the fact that you made homemade mayo. The people who never tried it really have no idea what they’re missing! Thank you! I know, it is so delicious! Love this salad. How long can you keep it after making? Hi there! It really depends if you’ve made fresh mayonnaise or not. If so, 1-2 days. If not, 3-4 I’d say! • finely chopped five hard-boiled eggs. Filled with all this bourgeois delicacy Provencal sauce, which was supposed to be cooked in French vinegar, two fresh egg yolks and a pound (400 grams) of olive oil. 2. I’v never seen ensalada russ with beets .